I was asked to do some research on how to deploy a Java application in Azure. Although you could fire up and configure your own virtual machine or create a Tomcat App Service, the option that intrigued me the most was Docker for Azure. Based on my experiences, introducing Docker Swarm Mode first and then diving into Docker for Azure will make the most sense. NOTE: If you’re completely new to Docker, read this article first. Swarm mode is Docker’s container management and orchestration tool. This allows admins and software developers to create and manage multiple Docker containers running on one or more nodes. Because this is native to Docker, you can use the Docker API to run native tools such as Docker Compose. Theoretically, the software can handle up to 30,000 containers and clusters of up to 1,000 nodes without performance issues. Node — a machine running the Docker engine. In most cases, this is a VM, but it can be a standalone server. Service — the definition of the tasks to execute on the nodes. When creating a service, you specify what container image to use and any commands you wish to run on it. Task — the Docker container and the commands to run inside the container. With swarm mode, you can have one or more tasks (e.g., multiple web server containers) to distribute the load of work being done. Swarm — a cluster of Docker nodes. When initializing a swarm, you’ll create one or more “Manager” nodes and one or more “Slave” nodes. Managers are responsible for distributing tasks within the cluster based on what nodes are available, while workers receive and run tasks. Install Docker for Windows. This install package has everything you need to get going to run Docker and swarm mode commands via Command-Line Interface (CLI). Create a virtual switch. This is needed for your VMs to be created properly and for your nodes to be able to talk to one another. 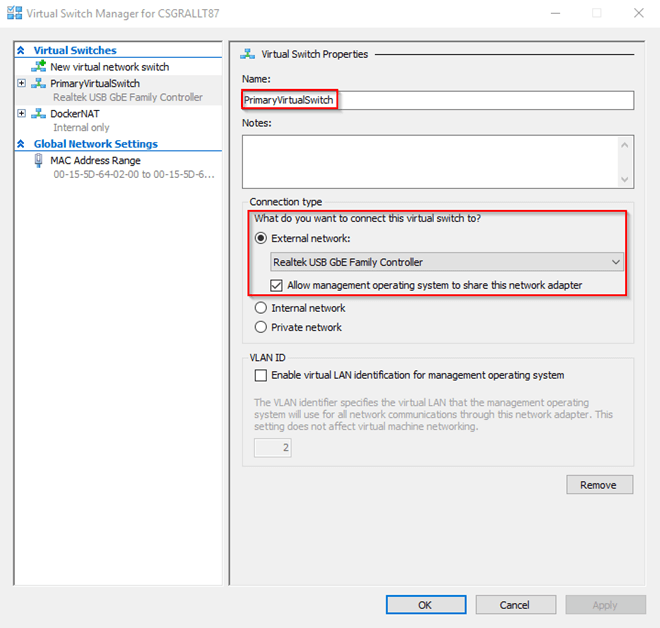 In the right Actions menu, click on Virtual Switch Manager… In the new modal, click on New virtual network switch and choose External. Create your VMs. We’ll be creating three VMs (one manager and two worker nodes). Open a Windows command prompt and run as administrator. (This prevents Hyper-V precheck errors during your VM creation.) To create a VM using Hyper-V, run the following Docker machine command in the following format: > docker-machine create -d hyperv --hyperv-virtual-switch ""
Now that the manager node is up and running, you can join your worker nodes to the manager. SSH into each worker node, just like you did into the manager, and then join them to the swarm by running the command generated from the docker swarm init command. At this point, you should have three nodes created and talking to one another. Let’s start deploying some things and see how swarm mode works. Once in, you can deploy your first service using the following command: > docker service create --replicas 1 --name HelloWorld alpine ping docker.com. So let’s examine this command to understand what’s going on. –replicas <unit> — tells the Docker swarm to create a number of tasks. In our example above, we only want one task. The default is one. –name <string> — gives the service a name. In our example above, the service is named “HelloWorld.” If this is not specified, a random name will be given to the service. alpine — the name of the Docker image we want to use. Alpine is a very lightweight flavor of Linux. At this point, we only have one task running in our service. Let’s add a total of four tasks for our HelloWorld service: > docker service scale HelloWorld=4 If you run “docker service ls,” you should now see 4/4 replicas instead of 1/1. So what exactly just happened? 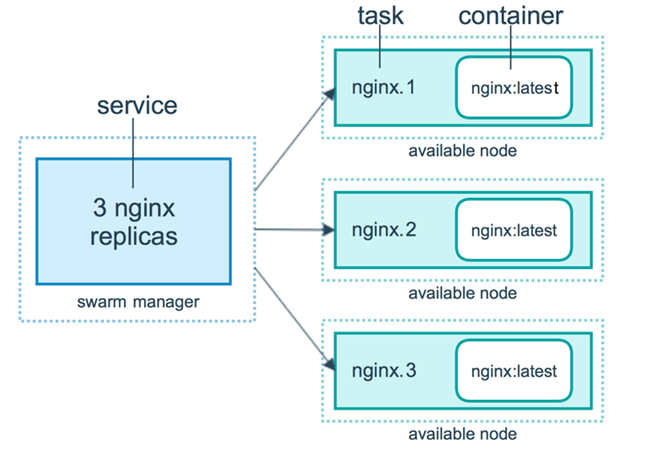 With Docker swarm mode, the manager decides which nodes are the most available and tries to evenly distribute the additional tasks across manager and worker nodes. Let’s say you only want three tasks to run instead of four. Just run the same command but with a 3 instead. Swarm mode will take the last three deployed containers and remove them. Fault tolerance You should have tasks running across some or all of your nodes. What happens if one of the tasks stops working? At the current command prompt, stay SSH’d into the manager node. Open another command prompt (remember to do so with admin rights) and SSH into the worker node that’s running the other task. You force stopped/removed the container on the worker node. Because you told the swarm manager to have a certain number of tasks always up and running, it will redeploy another container to replace the one that was just killed. It will again try to determine the best node to host the container. It’s fairly easy to determine which one is the redeployment because it will have been up and running for a shorter amount of time than the initially deployed/scaled nodes. This concludes the basics on how to set up Docker swarm mode and how it works. In part 2, we’ll go over how we can do the same thing in Azure. This article originally appeared on June 20, 2017.